Look no further for a versatile, zesty way to spice up your flavorful meals than this Del Sol crushed red hot pepper relish! The heat of crushed red pepper enlivens any dish with its smoky tones and one-of-a-kind spice. Simply add it to succulent meats or roasted vegetables, and it's sure to satisfy fans of spicier foods. Offer guests just the right amount by keeping it as a condiment at tables or salad bars! This pepper relish is a blend of crushed red chili peppers with heat, making it a truly flavorful garnish, topping, or ingredient in an array of dishes. The smooth consistency of relish is easy to blend into cream cheese or queso for a deliciously spicy spread. Its sure to enhance authentic Mexican-style offerings with the timeless and widely-enjoyed taste of red peppers. Carefully grown in the valleys of Northern Mexico, Del Sol's red peppers are picked at their peak of ripeness for maximum quality. Because they are crushed and packed into jars the same day that they are picked, you can save time preparing your own relish, while still receiving consistent, homemade taste! This Relish is a time saver, in our kitchen. A home style smooth smoky and spicy flavor. Economically priced in gallon size jars. Thanks, Webstaurantstore! 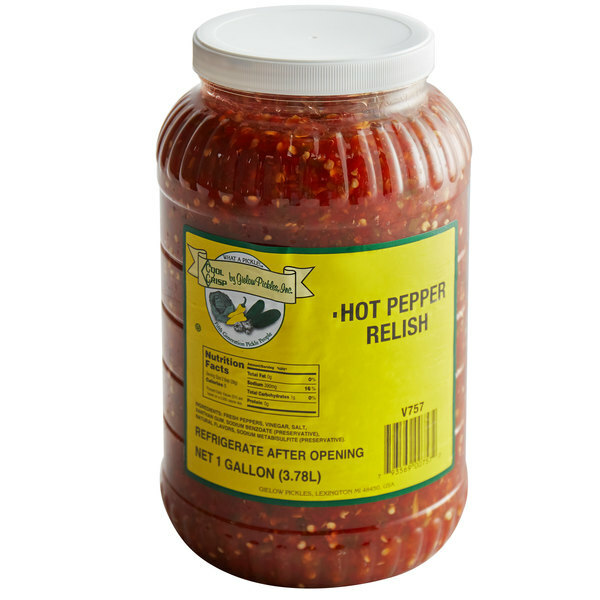 A great quality hot pepper relish that is great for making our Cajun style chicken salad. The relish is a great quality and has an unbeatable taste. The Del Sol Pepper Relish has a one of a kind taste. It definitely gives your Mexican food a kick! I would highly recommend this to any commercial kitchen or buffet. A nice pepper relish with a great kick that really adds a great flavor to sauces and dips. 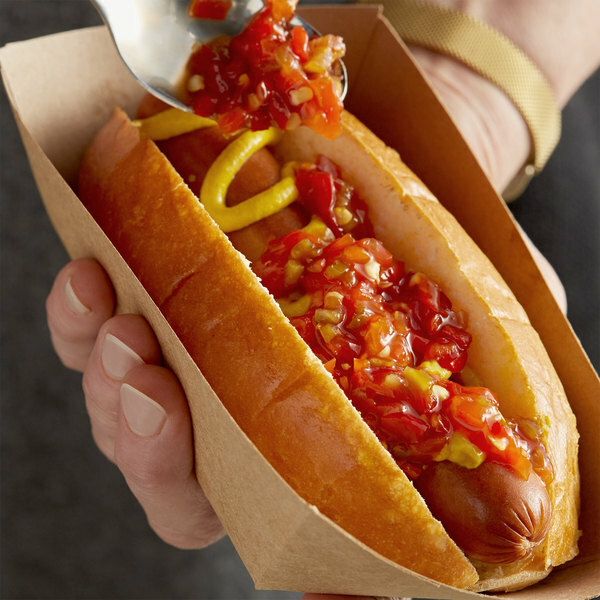 We love adding it our hot dogs as well for a spicy twist. Great for enhancing a wide variety of dishes, there is a lot so a little bit goes a long way. Great price on this as well. We usually get items like this hot pepper relish from food suppliers like sysco. Not any more. webstaurant charges half of what sysco does, even with shipping considered its a great deal! This is good as is for those who can handle the spice. It is also very good for making salsa, spaghetti sauces, and so much more. This product has so many uses its amazing. Its very spicy but if you use it sparingly you can give any meal a great flavor enhancer. Its just not for Mexican foods it can be put into anything. WORKS REALLY WELL WITH OUR STAPLE SANDWICH AND THE PEPPER IS JUST RIGHT. THIS DRESSING CAN BE USED ON A VARIETY OF DISHES AND EVERYBODY LOVES IT. This pepper relish by Del Sol tastes amazing! It is a great relish for a cold pasta salad to add some heat! Nice on a sandwich too! !